My girlfriend of the time was born and raised in India and I had been staying at her place for a few weeks. We had gotten bored and so decided to travel somewhere. But we could only travel together for a week, (I’ll spare you the details as to why), so the best place for it, we thought, would be Rajasthan. Rajasthan is arguably the best of Indian tourism. You’ve got great cultural and historical sites – eye catching forts in Jodhpur and Jaisalmer; the holy lake in Pushkar – and you’ve also got great experiences, like camel safaris through the desert, and this is what drew me to the place – I had neither been on a camel or to any desert, and what’s better than combining the two! The camel safari is one of the fun things to do in India and central to Rajasthan tourism and more specifically Jaisalmer tourism (the city inside the state of Rajasthan where you do the safari from), and you’ll know exactly what I mean when you arrive: you can’t walk ten metres without seeing one advertised. Unless you’ve just arrived in India this won’t shock you; little of what’s available to the tourist involves a straightforward decision, and the camel safari is no exception. But that’s all part of the fun in traveling this vast country I hear you say. Quite possibly true. If you disagree, look no further, I’ll tell you about my experience of it, which luckily enough turned out to be pretty positive, and give you some useful tips as I do so. The hotel Anu and I were staying in offered to arrange the safari for us. (Though common for hotels to book activities on tourists’ behalf I would advise, generally speaking, shopping around first, the benefits of this will soon become apparent in what you read below…). And the price they mentioned, which probably included commission, was competitive: they were asking for 1400 rupees and places I had seen advertising were asking for around the same, give or take a few hundred rupees. So I was happy to go with the hotel. Anu wasn’t so keen though – coming from India, she was always much more thorough than me when it came to making these sorts of decisions. And though this drove me mad sometimes, normally when I was hot, bothered and tired, as you are a lot of the time in India, I gave in and was pleased I did in the end. So the search for camel safari operators continued, and we soon came across a place called Adventure Travel Agency. As it seemed to specialise in desert camel safari tours, unlike other places which were hotels/guesthouses or restaurants offering a camel safari tour (maybe these places did it themselves, or were given commission for arranging it by a camel safari company), we were impressed. Once in the shop, the owner of the company sat us down, kindly offered us some chai and went on to making a pretty professional presentation about the safari. He showed us some great pictures taken on a previous tour, a short movie that had been made by a previous tour-goer, and the thick blankets- he called them slacks – that we would be sleeping in. This quite elaborate – for India anyway – display of professionalism certainly won me round. He told us about all the available options – see website for all the details- and we chose the over-night jeep camel safari tour. This was for a price of 1750 rupees, which was on the dearer side, but we were impressed by his sales spiel. Anything longer than the one night option would have been too pricy, and in hindsight, a little boring in my opinion – since all it is you do is ride on a camel, camp out and visit some villages. But of course this is totally up to you. The next day we arrived back at the shop to be picked up and taken to the desert. A whole group of us were packed into two jeeps and taken to a little village where we got on the camels for the first time. We went camel riding for the rest of the afternoon and then set up the desert safari camp. The men – in charge of the camels – made rice and curry for us to eat, and we warmed ourselves by the burning fire. Soon we grew very tired after the afternoon’s riding (your legs get sore and start hurting quite quickly after jumping aboard) and got in the slacks provided. They were just what we wanted: the desert is freezing cold at night and these blankets were so warm and cosy. Staring at the desert stars that shone so fantastically brightly while underneath those blankets was really a magical end to the day. The next morning, once we had finished our breakfast and had helped pack up camp, we were back on the camels for more riding. We rode to a really small village and looked around. It was very interesting for us – so different: the houses, or huts I should say, were made from dung! And there were no TVs inside, shock horror! The villagers made us some chai and we tried, as best we could, to communicate to each other. Soon we were back on the camels again, and this time the men got them to race, which was a bit scary, though exhilarating. The camel under you starts galloping and you hold on as tightly as you can, (of course if you don’t feel comfortable with this the men will stop them racing as they did with us once we’d had enough). And soon after that it was over, and I was glad: my legs were killing me by this point! 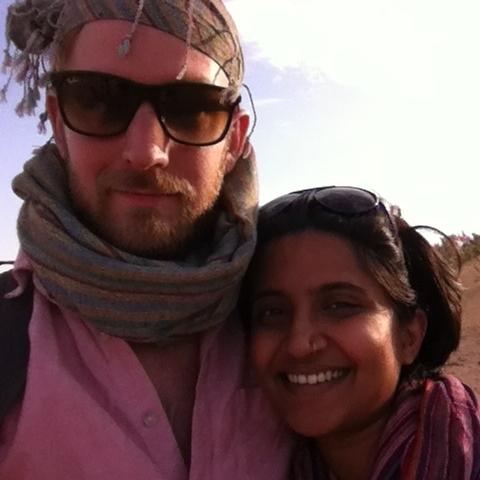 We were taken back to Jaisalmer in the jeeps and free to go. With regards to what to pack for camel safari, definitely don’t bother with a sleeping bag or an inflatable pillow as you will be provided with pillows and really warm blankets. Absolutely make sure to bring a couple of layers of your warmest clothes – jumpers or fleeces (men, women) – for once it gets dark: I had brought a few layers along but was still really cold until the fire got started, and was only warm enough once under the blankets, so do make sure the clothes you bring are super warm. Also, make sure to bring some thick socks (men, women) for when you’re under the blankets, especially if you’re tall like me and don’t fit in to most beds in India! It would be a good idea to bring along some snacks – crisps etc – as if like us you choose to do the overnight option you will only be given supper and breakfast. Also, absolutely make sure to bring sunglasses (the company will tell you this but just to reiterate! ), a hat, or scarf that can function as a turban, and sun cream for face and body; it would also help if you brought a headlamp for when it gets dark – as who knows when you’ll need the toilet… And on that note, make sure to bring toilet paper and cleansing wipes. When you need the toilet you’ll be doing it the very old fashioned way. You’ll have to find a private spot away from the camp (don’t worry, you’re in the desert, there are many) and do it there, and after you’re done make sure to burn the toilet paper so as not to leave a mess, so bring a lighter. On a pleasanter note, make sure to bring your camera, or even a selfie stick for selfies on the camel! And if you have one, bring your tripod along for the night sky (which you will be sleeping under, you won’t be in a tent) as it’s incredible. One thing that I really liked about our camel safari was that we didn’t see other groups from other safaris at any point. All of the tour operators promise a ‘non touristic’ safari and so did ours, emphatically, but to the company’s credit it was just us out there. At no point did we see any other tours- not when we were out on the camels or when we were in the village.